This leg gloss will leave your legs with a gorgeous reflective golden shine without being greasy or oily. It’s very rich so you can moisturise with it too. If you have very dry skin you can layer the skincare which is what I would recommend in winter anyway. Massage your moisturiser into your skin, wait a few minutes then follow with the Evolve Satin Leg Gloss as the party-perfect finishing touch. This has a distinctive fragrance so to avoid scent clash, try this over a fragrance free cream. Always use eyelash curlers on completely bare lashes. If you use them on lashes that already have mascara on them, you risk breaking your lashes. Not good! Take off the clip that keeps the curlers secure, and use your thumb and forefinger or middle finger to open them up using the finger holes. You should easily be able to do a pincer movement with your fingers. Open the curlers, place your lashes into them so the middle of your lashes sit on the white pad then squeeze them shut and hold for 10 seconds. Release and repeat on the other eye. I like to do this process twice to really open up my eyes. I find it is easier to put mascara on after curling my lashes. My top tip: once you have clamped your lashes, look down. I find it helps to stop me blinking and stops me thinking about blinking, which makes me blink! At one end of this mascara is a flat, very slightly curved brush in a rectangular shape instead of the usual spherical or cylindrical wand. I use the flat, more concave side to apply the mascara then push the convex side into my lashes to curl them, then finally separate the lashes using the narrow edge. Doing this process once is enough for daytime but for evening drama, do it all again. Wait for your upper lashes to dry then use the other end of the mascara to lengthen and define your lower lashes. Look up, then starting at the base of the lashes wriggle the brush down until you get to the tip. This is a great product if you are a beginner or have a shaky hand. It glides on like a liquid but you have more control due to the liquid-gel formula. It takes a little time to dry so you are able to correct mistakes before it sets. I love this as I always make mistakes! When using this, ensure you wipe of all excess product inside the tube as the brush holds a lot of eyeliner. I like to start in the inner corner of my eye and stroke the brush along my lash line towards the middle of my eye. I then go to the outer edge, judge where I want the flick to begin and glide the brush from the outer edge towards the middle of my eye. If there’s gap, I fill it in. I find that this gel eyeliner screams out for you to do a cat eye. In fact, without intending to I ended up with one every time I used it and it was so easy there was no point in protesting! For speed, I apply lipstick from the bullet. Blot with tissue and apply another layer. To make it last longer, apply with a lip brush so you can really work the colour into your lips. Rather than just slapping on these day creams, massage them into your skin in circular motions working from your nose outwards and really take in the scent. Enjoy the experience. Your skin and mind will thank you for it! First check the lashes are the right size by holding them against your eye. If not, trim them. Although the instructions say trim from the outer edge, I prefer to trim a little from each side so you don’t lose the shape of the lash. Trim a little at a time and keep measuring against your eye. If you cut too much you can’t put it back! Apply a thin layer of glue to the band and wait for about 1 minute for it to go tacky. Now look down (but don’t close your eyes) and place the lash above your natural lashes as close to your lash line as possible. Do not stick them to your actual lashes. Using your fingers or cotton buds, hold the lashes in place at either end for about a minute while you wait for the glue to set. My favourite tip: do all of your make-up and put your eyeliner on first. That way, if there is a gap between the lashes and your lashes, it won’t be too obvious. Trying to fill in the gap afterwards doesn’t work very well. This is a very gentle eye make-up remover. For best results, soak a cotton wool pad in the eye make-up remover and hold the pad on your eye for about 30 seconds. Gently wipe away towards the outer edge of your eye. Repeat if necessary. 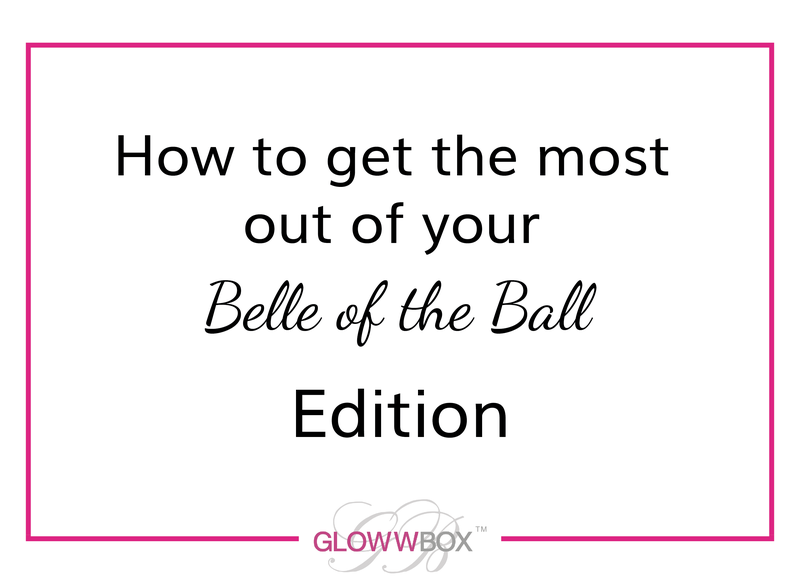 We’d love to see what looks you create with your Belle of the Ball GlowwBox. Post some pictures on Instagram tagging @glowwbox and #glowwer!